Don't you just love a great denim jacket? I literally cannot get enough. I have so many different styles and shades of denim. But this version from Free People is my new favorite. I love the button detail and that it is dressier than the other jackets in my wardrobe. I decided to pair this with my new go to black skinnies (I've been into AG jeans so much lately), and this cute graphic tee from Vici. I love tying my tees in a front knot. It is such a fun, casual addition to a look. And I just picked up these comfy Sam Edelman heels. I love them and I feel like I can walk in them for hours. ( I also got them in camel). 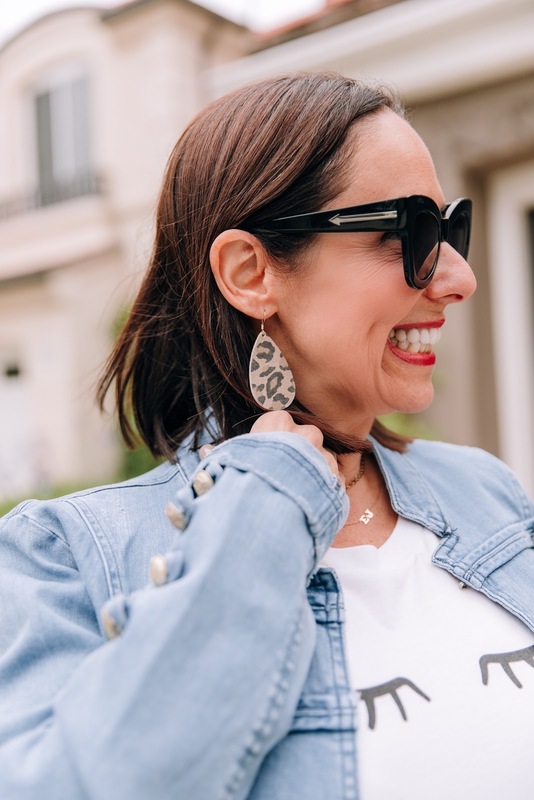 I also wanted to share with you these cute earrings from @nickelandsuedehq How cute is this leopard print ?You have to check them out. I really hope you invest in a fun and different denim jacket. It is the perfect alternative to your everyday denim look. Thanks to Kara Nixon for photos. You can shop this look by clicking on the links above. Happy Reading!!! !